Works by Tiffany Studios are highlighted featuring an array of glassware, lamps and metalwork. On June 10 Bonhams, the third largest international fine art auction house, will conduct a highly anticipated auction of 20th Century Decorative Arts, comprising furniture and objects spanning the period from 1895 to the present day. 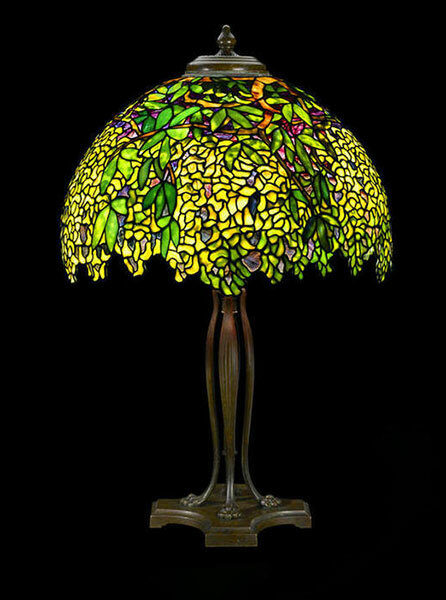 Tiffany Studios Favrile glass and patinated bronze Laburnum table lamp, circa 1910. Fabulous color online catalogue with pages of detailed photos of works by Louis Comfort Tiffany and Tiffany Studios can be found at www.bonhams.com/21696. Works by Louis Comfort Tiffany and Tiffany Studios are highlights in the sale, featuring an array of glassware, lamps and metalwork, including items from the collection of Henry B. Platt, great grandson of Louis Comfort Tiffany and former President of Tiffany and Company, including an impressive Banded Turtleback Tile table lamp on complimentary illuminated turtleback tile base (estimate $40,000-50,000). In addition a large and brilliantly iridized Jack-In-the-Pulpit vase, one of Tiffany’s most organic “vasiforms” (estimate $20,000-30,000) will be offered, as well as two stellar Tiffany Favrile glass and bronze table lamps. From the estate of Norman Hobday (Henry Africa), noted San Francisco restaurateur and collector, comes an extraordinary Laburnum table lamp (estimate $250,000-350,000). This irregular lower bordered lamp has rich, vibrant colour in the leafage, blossoms and background glass, synonymous with Tiffany’s most successful designs. And from the former collection of Henry Louis Fredrick Hollrock, a successful 19th Century Brooklyn importer, comes a Jonquil-Narcissus lamp (estimate $50,000-70,000), a rare example of Tiffany Studios using two distinct flowers in the same lamp. Opening the sale will be a fine private collection of 43 American Catalin radios, produced from the 1930s-1940s, the heyday of the American Art Deco streamlined design movement. The collection features colourful and iconic examples by Garod, Emerson, Fada, Sentinel and Motorola, to name a few. Highlighting the Art Deco section, will be several important works by French designers Emile-Jacques Ruhlmann, Marcel Coard and three works by Master French lacquerist Jean Dunand, including a red lacquer and metal vitrine (estimate $20,000-30,000); a lacquered low table with goldfish (estimate $20,000-30,000) and a pair of lacquered panels with Asian dancers, probably created for the 1931 Colonial Exhibition in Paris (estimate $50,000-70,000). A rare group of American Art Deco furniture, designed by and originally from the private collection of Andrew Szoeke, Viennese-born calligrapher, illustrator and furniture designer, will also be presented. Inherited by Szoeke’s son Thomas, the pieces feature extensive marquetry inlaid tableaux. The Art Deco period in Italy produced some beautiful and whimsical ceramic figures. From the Lenci Studio in Turin, come a group of five stylishly-painted ceramic female figures, and from the Zaccagnini Pottery come a group of 12 rare cartoon character figures based on and licensed by Walt Disney. 28 works by Contemporary Studio Artists will be featured from the collection of Sherley and Bernard Koteen, patrons and founders of the James Renwick Alliance at the Smithsonian Museum in Washington. This group comprises fine examples of glass, ceramic, wood and metal by such renowned artists as Judy Kensley McKie, Rudy Autio, Betty Woodman, Albert Paley and Dante Marioni. 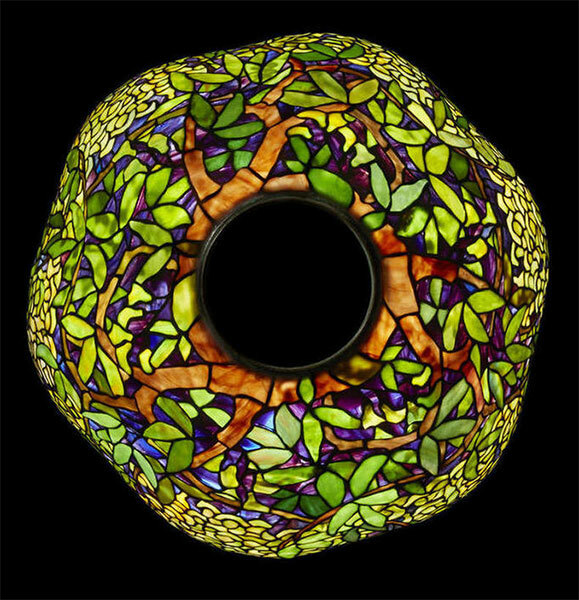 The auction will conclude with a selection of glass and bronze sculptures by William Morris, one of America’s premier glass artists. Included will be a bronze Canopic Jar (estimate $50,000-70,000), a unique multi-sculpture Trophy Panel (estimate $200,000-300,000), a cast glass Grillo from the Mazorca Series (estimate $15,000-20,000), a multi-object Suspended Artefact: Baleen and Walrus Tusk (estimate $70,000-90,000) and Laibon Man from the Man Adorned Series (estimate $60,000-90,000), which features the tattooed head of a warrior surrounded by a remarkable necklace of horns. Exquisite, gem-like boxes were the gift of choice for European nobility. The queen often enjoyed sleigh rides around Windsor during the winter months. Furniture, sets and props from production of Boardwalk Empire series are available to bidders.